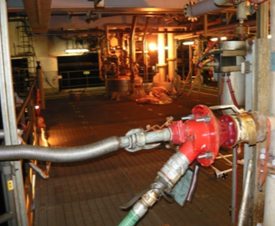 Pipetech were tasked to unblock and descale the 18” produced water caisson on BLP platform Britannia. Using the Aqua Milling® system with polishing and cutting nozzles negotiating a 2” nozzle and 90deg bend to a total reach of 40 metres. 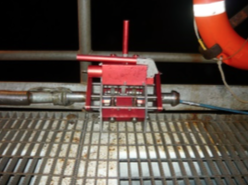 Pipetech was approached by BOL to unblock and descale a problematic caisson which was discharging produced water via its overflow, causing problems for DSV and supply boat operations. Utilising Pipetech’s scale collection interface, completed successful unblocking and polishing of the 40 metre caisson effectively and safely using only one entry point. 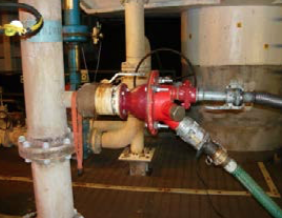 Ability to carry out the cleaning via entry from one 2” nozzle located upstream of the blockage whilst the caisson remained online. Successful negotiating of 90 degree T-piece to clear both upstream and downstream of entry point. 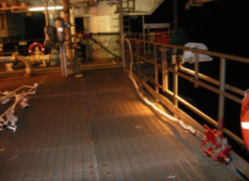 Safety – Fully contained remotely operated cleaning system carried out cleaning within a controlled area on cellar deck without need to expose personnel to potential debris or high pressure water. Flexibility – Aqua Milling® of 18” caisson and adjacent 8” feed line upstream of entry point returning the system to a free flowing state. "Aqua Milling® system is extremely efficient and cleans pipework without causing any damage."